Powers/Abilities: Mairi has extensive knowledge of the Celtic Gods and fairy folk. She can sense their presence and can communicate with them. In addition, she can call on the Earth spirits for assistance, although she only requests aid and cannot command it. In one instance, she called on the Earth Mother to shatter and collapse an underground cavern. 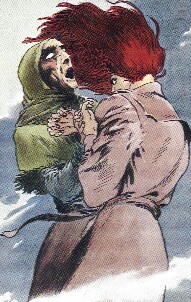 Her senses extend to the spirits of mankind as well, and she was able to recognize Peter Parker as the Man O'Spiders. As it takes some time and concentration to commune with the spirits, Mairi is not much help in a direct fight. Height: 5' 8" Weight: 90 lbs. History: The origins of Mairi remain shrouded in mystery. She appears to be an elderly woman, perhaps close to a century in age, but she could easily be several hundred, or even several thousand years old. (MGN: Spirits of the Earth) - Angus Munro made an alliance with the Hellfire Club, in which they sought to drive the people from the village of Localsh, so that they might have the secrecy to develop a powerful weapon. In order to drive the villagers out, they used holographic projectors to create images of evil spirits, which chased and tormented them. Mairi recognized that these were not actual spirits, and told the villagers so in order to calm them. Nonetheless, when Hugh, the grandson of Lord Hugh, laird of Clan Munro, vanished--apparently at the hands of spirits--the town became overwhelmed with fear. 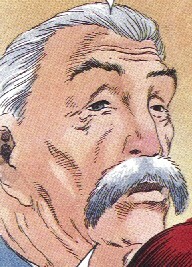 Spider-Man, who had come to the village of Localsh to see property that Mary Jane had inherited from a relative, investigated the disappearance of Hugh. However, the holographic "spirits," secretly combined with the vibratory force of the Hellfire Club's weapon, kept him from getting too close. Even worse, the townspeople, whipped into a frenzy due to their superstition, saw him, thought him to be a demon, and chased him with torches and pitchforks. Not wanting to hurt the innocent people and not having any skyscrapers on which to swing away, Spider-Man ended up trapped in a tree. At the point, Mairi arrived, and her presence brought calm to the villagers. She told them that the Man O'Spiders was not a demon, and that she would rid the town of the real "demons" that were plaguing them. Mairi led Spider-Man and Mary Jane to Duncraig Castle, the ancestral home of Clan Munro. Armed with the knowledge that the "spirits" were just illusions, Spider-Man made his way into a subterranean cavern below the castle. 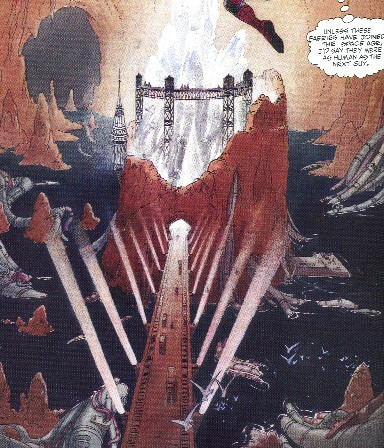 There the Hellfire Club used their sonic weapon to capture Spider-Man, and then revealed their plan to use their sonic crystal to purge Localsh of every living person, since they would not be driven out. 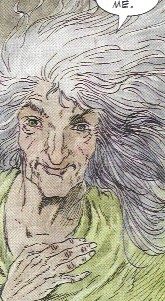 However, Mairi convinced Mary Jane to add her youthful spirit and energy to her own, and Mairi released a spirit song which called down to the slumbering mother of his all, who responded with a groan that "splintered the delicate embrace between the arching roof of the crystal's cavern, and its most ardent of wooers, gravity." As the cavern began to collapse around them, Spider-Man escaped, rescuing the young Hugh in the process. Spider-Man, though badly injured in the collapse and still feeling the effects of the sonic weapon, overpowered the maddened Angus Munro, who then leapt off the edge of a cliff to his death. A wave of magical force then destroyed all evidence of the Hellfire Club's presence, restoring the former purity of the Castle, its glen, and the loch below it. Young Hugh was left in Mairi's care, until the time that he would one day grow to fulfill the trust that the people of Lochalsh and the old laird have put in him. Comments: Created by Charles Vess. Mairi is a not uncommon name in Scotland (not very common either, mind you). It's Celtic, and I ran into several girls with that name when I was teaching up there, before moving to London. It's pronounced more like "marry" than "mary", and has an unreal number of possible spellings for such a simple sounding name (you think Katherine / Catherine / Kathryn, etc is bad!). Replace "not Scottish" with "crap." As confirmed in Thor I#300, Gaea is the Earth mother of all of the pantheons of Gods of Earth. For the Tuatha de Danaan, the Celtic Gods, she took the name Danu. The Nephew of Sir Hugh, Angus discovered the immense crystal below Castle Duncraig. Angus seemingly vanished from Lochalsh that day, but in actuality he had taken a piece of the crystal to the USA. 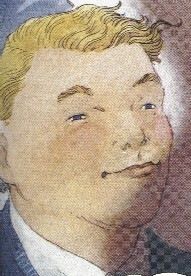 Angus had learned that his ancestor, Duncan Munro, had been a founding member of the original Hellfire Club in London. In the US, he met with the Inner Circle of the modern day incarnation of the Hellfire Club, who also saw the potential for the Crystal. They agreed to back him, and a group of agents accompanied him back to Lochalsh. As they constructed a machine to harness the vibratory force of the sonic crystal, they began to appreciate the need for privacy. To this end, they used holographic projectors to create images of evil spirits, which chased and tormented the villagers. In addition, Angus had Sir Hugh's grandson, also named Hugh, kidnapped, and the rumor spread that he had been taken by the fairy folk. Angus used his young hostage to ensure Sir Hugh's silence and support. Angus eventually saw that the people would not be drive out, so he planned to use the sonic crystal to destroy all life in Localsh. 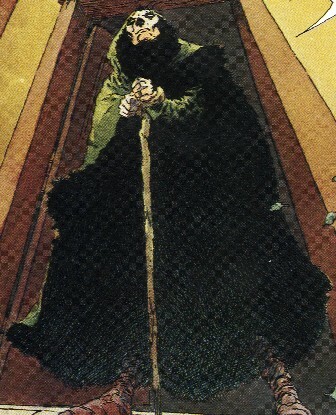 He imprisoned Sir Hugh when he resisted, and he even managed to use the crystal to capture Spider-Man when he came to investigate. However, Dark Mairi managed to call upon the Earth Mother to shatter his cavern, destroying his plans. Angus escaped the collapsing cavern and held young Hugh off the edge of a cliff in an effort to hold off Spider-Man, but the webslinger managed to take him down anyway. His plans in ruin, Angus leapt off the edge of a cliff to his death, and the Earth Mother then washed away all evidence of his work, and restored the Castle and the loch. The laird of Lochalsh and the uncle of Angus, his silence and support was forced when his grandson, Hugh, was kidnapped. He tried to save young Hugh, and tried to resist Angus' plot to kill everyone in Lochalsh when they wouldn't leave, but was mortally wounded in the ensuing struggle. The grandson of Sir Hugh, he was the last in the line of Clan Munro. Angus kidnapped him to force his grandfather's support, but he was eventually saved by Spider-Man and Dark Mairi, and he went to live with Mairi until he would one day return to the castle as Laird of Lochalsh. It was found in a subterranean cavern beneath the Castle Duncraig. 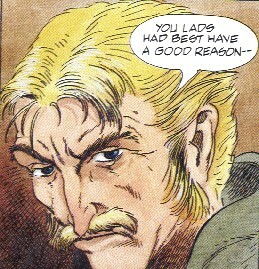 It's origins remain a mystery, but Angus Munro and the Hellfire Club sought to harness its power as a weapon of great power. It was presumably destroyed when Gaea caused the cavern to collapse. The weapon made from the crystal, even in its incipient stage, could release sonic vibrations which could instantly incapacitate Spider-Man. As it neared completion, they believed it would be able to destroy all life in the nearby village of Lochalsh, and eventually anywhere in the world. All other characters mentioned or pictured are ™� and � 1941-2099 Marvel Characters, Inc. All Rights Reserved. If you like this stuff, you should check out the real thing!